If you need a protective suit that is flexible, but also offers advanced protection against low concentration acids and alkalis and cryogenic hazardous substances, then the Drager CPS 6800 is a great choice. The gas-tight Drager CPS 6800 is perfect for protection against gas, liquid and solid hazardous substances. The suit is made from Umex material, which provides both comfort and guaranteed durability. This flexible suit can be reused and is great for working in the cold. It is also ideal when dealing with cryogenic materials. With a gas-tight Polyurethane (PUR) closure system and a handy radio pocket, the Drager CPS 6800 is extremely efficient, the boots and gloves which are attached can be replaced with ease and the suit also offers the option to attach gas-tight socks as an alternative. 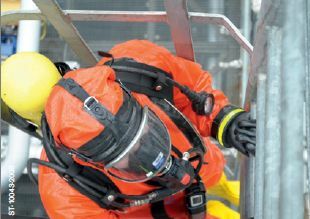 The Drager CPS 6800 enables the user to switch between easily fittable, gas-tight face masks with the same suit. The integrated PT 120 L control valve gives the Drager CPS 6800 an optional ventilation system for easy connection to a number air sources. This rapidly reduces build-up of humidity, allowing the user to cool themselves without taking off the suit. Comfort is guaranteed when wearing the Drager CPS 6800, even in challenging and potentially harmful situations. The suit comes in five sizes, to maximize mobility and comfort. The Drager CPS 6800 is made of a highly flexible and soft material and comes equipped with individually adjustable braces to ensure a comfortable fit.